In what has become an annual sign that spring is around the corner in Boston, Truck Day will arrive on Friday, Feb. 12, when the Red Sox moving van will be loaded at Fenway Park for the 1,467-mile trek to the team’s spring training complex on Edison Ave. in Fort Myers, Fla. The truck is expected to arrive in Fort Myers on Sunday, Feb. 14. Due to the Winter Classic festivities this offseason, many items being shipped to Florida have already been removed from Fenway Park. 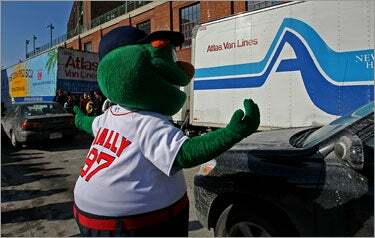 In the past, the 18-wheeler has departed from Fenway at the players’ parking lot entrance on Van Ness St., followed in procession by Fenway ambassadors, Red Sox staff, and Wally the Green Monster tossing gifts to fans from a flat-bed truck. Truck driver Al Hartz of New England Household Moving and Storage, the company that has carted the Sox gear to Florida for the past 12 years, is expected to be back to drive the truck, which has been upgraded for this year’s trip, for the 12th time himself. To whet your appetite, here is our photo gallery of last year’s Truck Day festivities, the 2008 Truck Day ceremony, and here are our ’07 photos of the truck being loaded with bats, balls, and any other stuff the Sox need in Fort Myers (a motorcycle or two, perhaps?). And for those of you who really can’t get enough, we have photos of Truck Day ’06 as well. Reporting day for Red Sox pitchers and catchers is Thursday, Feb. 18. First workout for Red Sox pitchers and catchers is Saturday, Feb. 20. Planning on heading to Fort Myers to catch the Sox at spring training? Be sure to check out our fan’s guide to the area before you go.